Stagecoach 2014 roundup: Lynyrd Skynyrd, Shelby Lynne, Don McLean, more! For the countless Stagecoach-goers who never got over to check out the Americana featured in the Palomino and Mustang tents early Friday afternoon, they missed out on some outstanding new music-makers. What's more, they were robbed of a chance to hear the genre's roots that these days seem a world removed from the heavier rock and pop feel of so many mainstream country acts. Hannah and Talbot, a duo backed by several musicians during their Mustang set, celebrated those early sources with plenty of great tunes delivered with authentic zeal. Infectious and crowd-pleasing songs like "Not from Texas," "Cowboy Saturday Night" and "Miss Molly" got their strong set going, the troupe enjoying its spotlight with a number of authentic cowboy tunes. The highlight was a performance of "Murphy's Law," with a long and expressive acoustic guitar solo leading into the rest of the band lifting the song's momentum. Another of the afternoon's highlights came courtesy of JD McPherson (above), who brought his retro rockabilly to the Palomino tent. With a sharp four-man ensemble behind him, the singer-guitarist served up both uptempo rockers ("Dimes for Nickels," "Fire Bug") and slower pieces, like the moving "Country Boy." Nashville's Howlin' Brothers come anchored in a blend of old-time blues and bluegrass, but here at Stagecoach that approach was delivered with a good helping of indie rock, an attack that attracted an enthusiastic crowd to the Mustang tent. The trio's 40-minute turn was solid all around, and it didn't hurt that the multitasking outfit (several members often perform on different instruments at once) has an experimental and fun way of performing originals and classics. With a new album, Trouble, set to land May 13, there were all kinds of fresh selections to share, my favorite being the pretty "Tennessee Blues." That song, featuring fiddle player Ian Craft on vocals, featured a dancing melody on his instrument, while a riveting bass line was played by Ben Plasse. Elsewhere in the set, guitarist Jared Green was astounding while playing guitar and harmonica on "The White House Blues." As has become a wonderful tradition at Stagecoach over the past few years, producing an alternative Stagecoach apart form the main stage, a wide range of Americana and roots artists continue to shine inside the Palomino and Mustang tents. One of my early favorites was one-man band Shakey Graves, the moniker for Austin-based singer-songwriter Alejandro Rose-Garcia, who thrilled a pretty big crowd in Palomino. Sometimes joined by a lap guitar player and drummer, Rose-Garcia performed songs centered on a free-flowing lyrical style and edgy fretwork that was both textured and crunchy. The highlight was a potent version of his song "Late July," where his feel ventured toward Radiohead territory with shades of Thom Yorke. Just as impressive was Shelby Lynne, a cranky 2008 main-stage attraction but a standout in a better setting here, her voice powerful whether singing blues, gospel, country or material blending all of those styles. Chief among her highlights was the uptempo, gospel-flavored "Call Me Up," lead-off track on her new EP, Thanks, as well as her incredible emoting on a rendition of the pop staple "You Don't Have to Say You Love Me." Much has been said about our so-called celebrity culture, and Katey Sagal's appearance on the Palomino Stage underscored that. Clearly three to four times as many people who caught Lynne's affecting performance rushed over to the same tent right afterward to see the actress known for her roles on Married ... with Children and the current FX series Sons of Anarchy. Backed by her large ensemble the Forest Rangers, Sagal was the subject of an endless barrage of cheers, shouts of "I love you" and pauses for fan photos during her appearance. While she was personable and engaging, her run-of-the-mill voice, like her adequate musicians, added little insight to reworkings of material by Tom Petty ("Free Fallin'"), Dusty Springfield ("Son of a Preacher Man") and others. Based on the number of people who jammed into the Palomino tent on Friday night, Lynyrd Skynyrd, a late addition replacing Loretta Lynn, could well have performed on the Mane Stage. Yet there's no doubt that with the Palomino tent stuffed from front to back and on every side, there was palpable excitement throughout the legendary Southern rockers' 90-minute set. The band's performance was just fine, the Florida-spawned outfit still championing the hard Southern rock its original lineup popularized in the '70s. For the party-minded Stagecoach faithful, Skynyrd's sharp set was mostly a soundtrack to drink, cheer, dance and shoot photos. A young woman next to me waved a gigantic foam hand you'd normally see at a baseball game – and kept slamming it into my head, seemingly oblivious to those around her. Sadly, those busy with their extracurricular activities missed hearty versions of more than a dozen of the group's staples: "Call Me the Breeze," "Simple Man," "That Smell," "Gimme Three Steps," the indestructible "Sweet Home Alabama." This also was the only concert I can remember where bothersome fans who typically yell out "Free Bird" were rewarded for their cat calls with a mighty band on stage playing that request. The group, these days featuring only one founding member, guitarist Gary Rossington, closed out the night with a 13-minute take on that FM radio classic, complete with pretty instrumental piano intro, confessional middle (featuring singer Johnny Van Zant, younger brother of original frontman Ronnie Van Zant, who died in a 1977 plane crash that claimed three other members) and the epic's blistering three-guitar afterburn. Lera Lynn not only kicked off Day 2 of Stagecoach with her 1 p.m. set in the Palomino tent but acknowledged she wasn't going to let early concert-goers relax and kick back. "Good morning," she told her small crowd. "Are you well rested and recuperated from yesterday?" She then impressed in a big way, opening with "Lying in the Sun," a mid-tempo tune that revealed the Houston native has a strong voice and magnetic stage presence. Subsequent standouts offered up by the Nashville singer-guitarist's 45-minute set, including the country ballad "Whiskey" and memorably epic closer "I Become You," revealed Lynn can sing everything from quiet material to roots rockers with deft pitch authenticity. Definitely one to watch. Following Lynn on the same stage was Canadian star Corb Lund, who served up his distinctive blend of country and Western music with his touring band, the Hurtin' Albertans. Lund used humor as a key part of his 45-minute set, stopping during songs to offer quips as well as providing witty intros to his originals. The ones about life in Alberta ("Cows Around") and playful takes on everything from religion ("Bible on the Dash") and drinking ("Rye Whiskey/Time to Switch to Whiskey") to the survivalist movement ("Gettin' Down on the Mountain") are out of step with the majority of the Juno Award winner's contemporaries, but it was refreshing to the enthusiastic crowd positioned in Palomino having a blast. Kudos to Grant Siemens, whose work on electric guitar and mandolin brought extra layers to everything. From the start, Stagecoach has made a point of honoring country music's living legends; Saturday's early afternoon lineup added to that tradition by including John Conlee, who scored a number of hits in the '70s and '80s. The personable singer, 67, performed several of his most popular songs for an appreciative audience: the ballad "Lady Lay Down," the sober "Backside of Thirty," pretty piano-anchored "Friday Night Blues" and a country-rocker "Busted." Lovers of sounds ranging from old-fashioned Appalachian mountain music to bluegrass and classic folk-rock couldn’t go wrong if they hung out in the Palomino and Mustang tents the last half of Saturday. Trampled by Turtles continues to be a force of nature, as evidenced by the quintet’s set on the Mustang stage. While they occasionally touched on beautiful mid-tempo folk numbers, sometimes abetted by a touring cellist, it was the bluegrass-on-steroids material that delighted the party crowd living it up throughout the hour-long performance. The setting was perfect Sunday to arrive early and catch the day’s opener, I See Hawks in L.A. Over the years the locally loved band has been compared to everybody from the Eagles and Gram Parsons to Warren Zevon, and the quintet’s 35-minute set proved there’s truth in those associations. The group’s ’70s vibe rang true whether amid country-mining rockers (especially “Rock ’n’ Roll Cymbal from the Seventies"), post-psychedelic departures (“Raised by Hippies,” “Humboldt”) or Jayhawks-style folk-rock (“Good and Foolish Times”). Best known as the lead singer of power-pop heroes The Bangles, Susanna Hoffs and a tight-knit four-man band made the most of a fast-flying 40-minute concert set with a mix of new material featured on her outstanding 2012 album Someday, as well as artful covers and timeless Bangles hits. Highlights came early and often, including a tender version of Michael Nesmith's "Different Drum" (a 1967 hit for the Linda Ronstadt-led Stone Poneys), a rowdy and loose version of Big Star's "September Gurls," the lovely "Raining" off her latest studio disc and a Rolling Stones-styled version of the Prince-penned "Manic Monday" that was much more loose than the Bangles' original. For more details about Hoffs' set and some of the other great acts featured at Stagecoach last weekend, make sure to check out George A. Paul's roundup on his Music Minded blog here. With Corey Smith unable to make his 2 p.m. slot on the Mane Stage, Nashville outfit the Railers were called in to pinch hit. The group was up to the task and actually got some early birds to listen in the large expanse nearest to the festival’s biggest platform. But what a difference a venue makes: When only an hour or so later the same gang took to the Mustang tent for its scheduled appearance, they proved capable of convincingly winning over a crowd – not because they changed their approach but because they were in a setting where people could actually tune in more intently. One particular rocker, “The Lessons I Don’t Want to Learn,” featuring Cassandra Lawson on concertina and a good audience clap-along, was among the early highlights. A version of the Band’s classic “The Weight” came next, with the Railers’ shining harmonies and Jordan Lawson’s fiddle playing giving this version a unique touch. Wanda Jackson's 2011 performance at Stagecoach was such a success, here she was back again Sunday afternoon to bring her mix of '50s and '60s styles to the Palomino tent. While the 76-year-old Queen of Rockabilly is not able to get around much on stage nowadays, her voice and warm personality were fully up to delivering faves such as "Mean, Mean Man" (a hit in the late '50s), her 1960 hit "Let's Have a Party" and "Shakin' All Over" (off her Jack White-produced LP The Party Ain't Over). While those rollicking rock tunes got many to move to the groove, her voice was more fully showcased on her self-penned 1960 country hit "Right or Wrong" and a remake of the Rolling Stones' "It's All Over Now, which appeared on her most recent disc, 2012'sUnfinished Business. 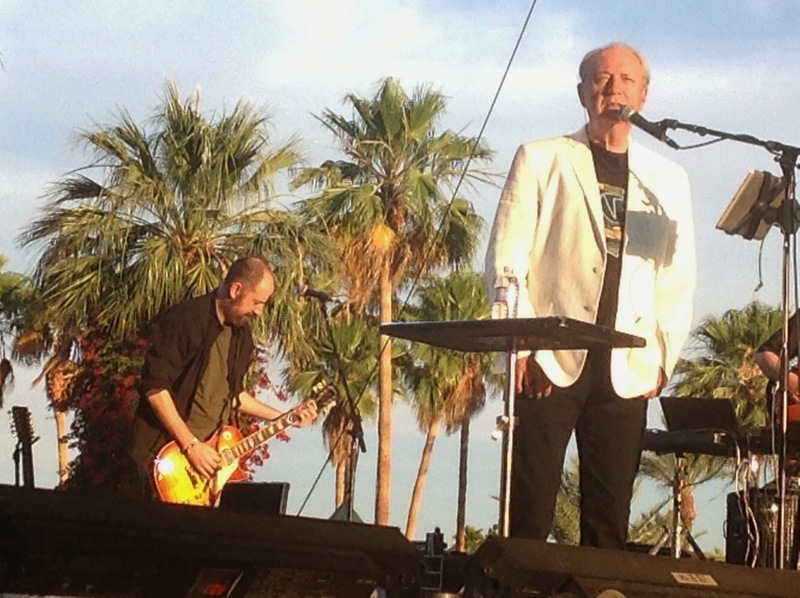 Michael Nesmith will forever be known as one of the Monkees, but the singer-songwriter made a good case for celebrating his role as a pioneering country-rock artist during his hour-long set in Palomino. He focused almost entirely on his post-Monkees songbook, with notable exceptions including a countrified version of one of his earliest compositions, "Different Drum" (as noted above, the song was also covered earlier by Susanna Hoffs) and the Monkees' classic "Listen to the Band." Backed by five skilled players – among them his son Christian, who proved to be an especially talented lead guitarist – Nesmith's work with the First National Band was featured early via "Joanne," a pretty country ballad that had the 71-year-old utilizing his still-strong falsetto while Christian played 12-string acoustic guitar in one of the most moving songs of the set. Elsewhere, he sang and rapped his way through the entertaining "Grand Ennui," one of the more interesting tunes from the 1970 album Nevada Fighter. Later, he focused on some of his more experimental songs, including the Latin-flavored gem "Rio" and the heavy-rocking "Dance (Dance & Have a Good Time)." Stagecoach 2014's schedule of roots and Americana music ended with a wonderful 70-minute outing from revered singer-songwriter John Prine, who attracted a sparse but almost fanatical crowd of enthusiasts to the Palomino tent. With his dramatic delivery now nearly a spoken-word approach on his effective folk compositions, Prine brought cheers with performances of "Six O'Clock News," the beautiful ballad "Souvenirs" and his oft-remade staple "Angel of Montgomery." April 24, 2014 - (Burbank, CA.) 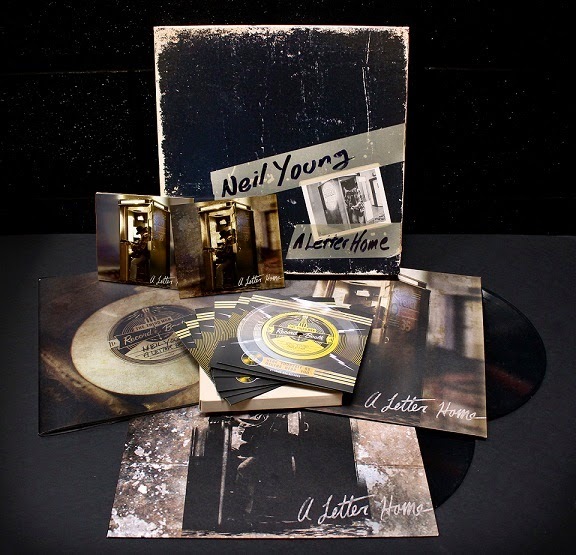 - Neil Young will release a CD, digital album and a Limited Edition Deluxe Box Set of his recent vinyl album A Letter Home on Reprise Records on May 27th. The box set is a beautifully packaged expanded version of the vinyl edition first released on April 18th by Jack White's Third Man Records. The Limited Edition Deluxe Box Set will also contain a Download card for the hi-res Audiophile version of the album. Click here to pre-order A Letter Home. Click here to view the album cover art. Click here to view the Limited Edition Deluxe Box Set package. As for the track-listing, Young chose songs that have personal meaning for him, such as British folk artist Bert Jansch's "Needle of Death" (which inspired Young to write 1972's "Needle and the Damage Done"), Bob Dylan's "Girl from the North Country," Willie Nelson's "Crazy," Don Everly's"I Wonder If I Care as Much," Bruce Springsteen's "My Home Town," and many others. Clickhere to watch a video for "Needle of Death"
"Blowin' In The Wind" backed with an alternate take / arrangement of "Crazy"
Superstar band Coldplay will present songs from its upcoming sixth album, Ghost Stories, in an hour-long special Sunday, May 18 (7 p.m. ET/PT) on NBC. 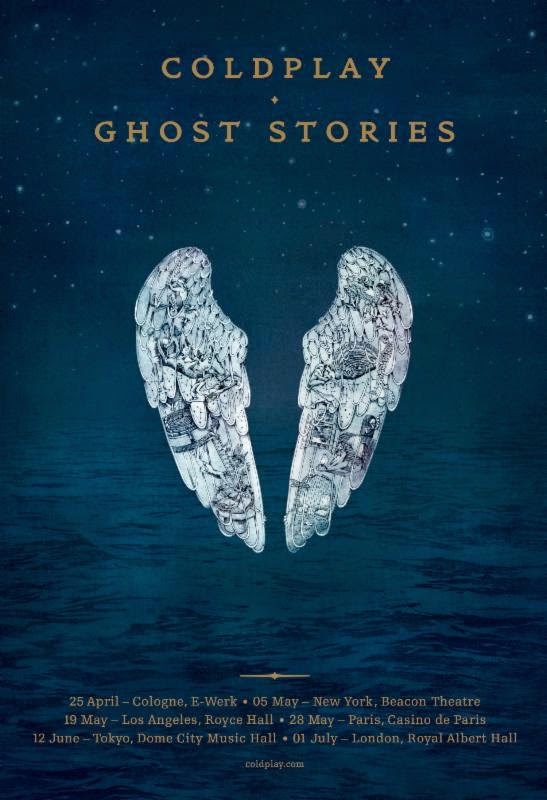 Titled "Coldplay: Ghost Stories," the special will focus on the multi-Grammy Award-winning band's latest album, which will be released worldwide May 19. 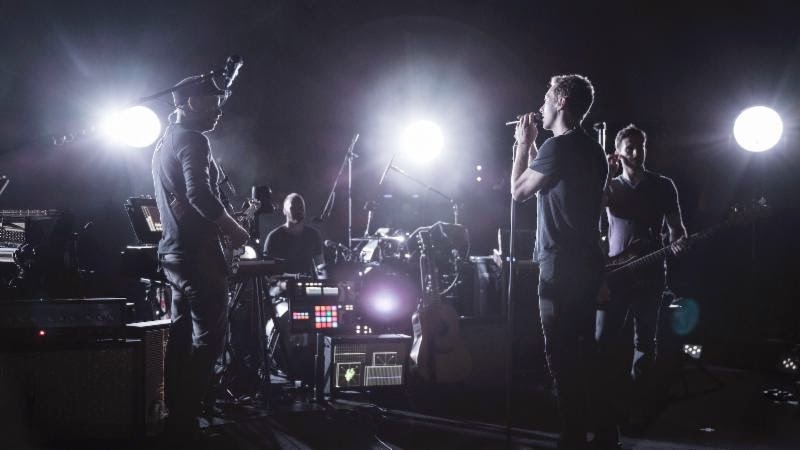 Directed by Coldplay Live 2012 helmer Paul Dugdale, this in-the-round special - recorded in front of an 800-person audience in Los Angeles in March - will blend live-performance footage with cinematic film. Atmospheric projection will deliver awe-inspiring 360-degree imagery - around, above and below the band - while being woven into the overall filmed narrative. The cutting-edge show is an immersive blend of light and video, dramatic staging and an intimate world-premiere performance. In addition to the new single "Magic" from Ghost Stories, the setlist for the special will also include worldwide hits such as "Viva La Vida," "Paradise" and "Clocks." The special was conceived by Coldplay, Paul Normandale and Misty Buckley. A trailer for the special may be viewed now at Coldplay.com. 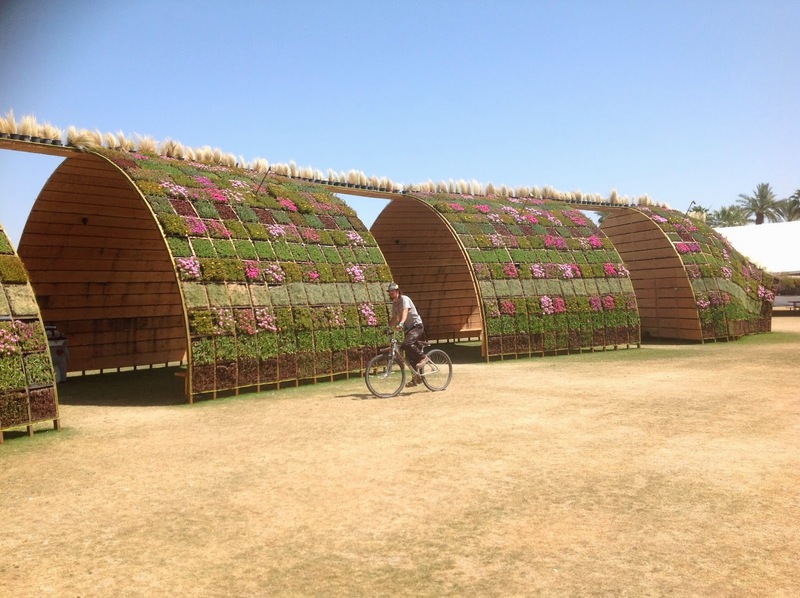 Poetic Kinetics' "Escape Velocity" at Coachella Valley Music and Arts Festival. Weekend 2 at Coachella Valley Music and Arts Festival (April 18-20, 2014) didn't kick off quietly on Friday morning, at least in the Gobi tent where Ramones tribute outfit Gabba Gabba Heys tore through 40 minutes of old school punk rock in front of a small, but enthusiastic group of early Coachellagoers. Highlights included the quartet's faithful versions of "Blitzkrieg Bop," "I Wanna Be Sedated" and "Beat on the Brat." For those of us who never got to see the Ramones live, this was likely a very fitting tribute. Following up on the same stage came dynamic sonic duo Wye Oak, whose magical appearance included singer/multi-instrumentalist Jenn Wasner and drummer-keyboardist Andy Stack creating enough textures and dynamics to rival just about any indie folk rock outfit today. The pair featured several songs from their forthcoming album Shriek including that disc's title cut, a dreamy synth-pop gem highlighting Wasner's distinctive soprano. ZZ Ward in action on April 18 in the Mojave tent. brought her infectious blend of R&B, pop, blues and rock in a Mojave tent performance that got the place moving like it was Saturday night. People cheered, moved and clapped to the mix of the Pennsylvania artist's high energy style that had her singing, playing blues harmonica or strumming her guitar, Ward's material was definitely what the crowd ordered. Early offerings ("Put the Gun Down," "Til the Casket Drops") and later favorites (especially the closer "Blue Eyes Blind") were delivered forcefully by Ward and her strong three-man band. Other day 1 standout performances came later that day via Neko Case's authentic and winning 50-minute set on the Outdoor stage (highlighted by a stunning version of "Night Still Comes") and even stronger subsequent turns from Broken Bells and The Replacements. Broken Bells' infectious "After the Disco" and set-ending "High Road" really hit home with a crowd that packed in front of the James Mercer- and Danger Mouse-led troupe. Neko Case performed on the Outdoor stage. Friday ended long after it started with a rousing performance by The Replacements, who were joined for most of the set by Green Day's Billie Joe Armstrong. Because Replacements frontman Paul Westerberg had been suffering from an ailing back, he was positioned on a large sofa for most of the show while Armstrong stood and added a flair to the proceedings ("Can't Hardly Wait" simply rocked). Day 2 kicked off with British soul singer Laura Mvula, who made the most of her early afternoon set in the Gobi by performing not only choice songs from her wonderful debut Sing to the Moon but even a non-album track about freedom titled "Let Me Fall" that included an undeniable rhythm provided by a stand-up bass and elements of African music. Other highlights of her 40-minute set included "She" and the infectious dance-minded "Green Garden." I then ran over to the Mojave (you do a lot of that at Coachella in the sport of "musical discovery") to catch the last few minutes of New York-based Bear Hands' set. The quartet's mix of dance and alt rock was effective on the original "Agora," notably how bass was used to help propel the song along. The next band I caught, White Lies proved to be one of my favorite performers of the weekend. Although I only got to see the English band's first five songs, it was immediately clear the group and their material outdistance their post-punk roots. The infectious "There Goes Our Love Again" was a clear favorite while "To Lose My Life" showcased the deeper emotional elements of the group's artistic reach. Playing in the heat of the late afternoon on the main stage, City and Colour (the moniker for singer-songwriter Dallas Green) and his band brought authority and authenticity of his blend of Americana, folk and country-rock with a power that connected with the large crowd. "Hope for Now" was among the standouts of City and Colour's 40-minute foray, with the song's long and emotional build steeped in power that was palpable. Like Capital Cities' amazing and high-energy 50-minute set a bit earlier that was nothing short of a dance party on the green, Foster the People found the power to move the masses came via unleashing a number of dance-minded songs that had festival-goers moving after dark. The group's "Pumped Up Kids" really excited the crowd, and the closer "Don't Stop (Color on the Walls)" allowed Foster the People to showcase the harder guitar side of their tuneful alt rock-dance approach. Saturday night ended with me wishing I could be in two places at once; catching the first 40 minutes of Muse on the main stage ("Knights of Cydonia" kicked things off with the band's characteristic bombast), and finishing up my night in a sea of dancing people in the Mojave as the Pet Shop Boys thrilled the party faithful with "I Get Excited (You Get Excited Too)," "It's a Sin," "Always on my Mind" and other hits from the British duo in a showcase that included incredible lighting and artful sets as well as several costumed dancers. 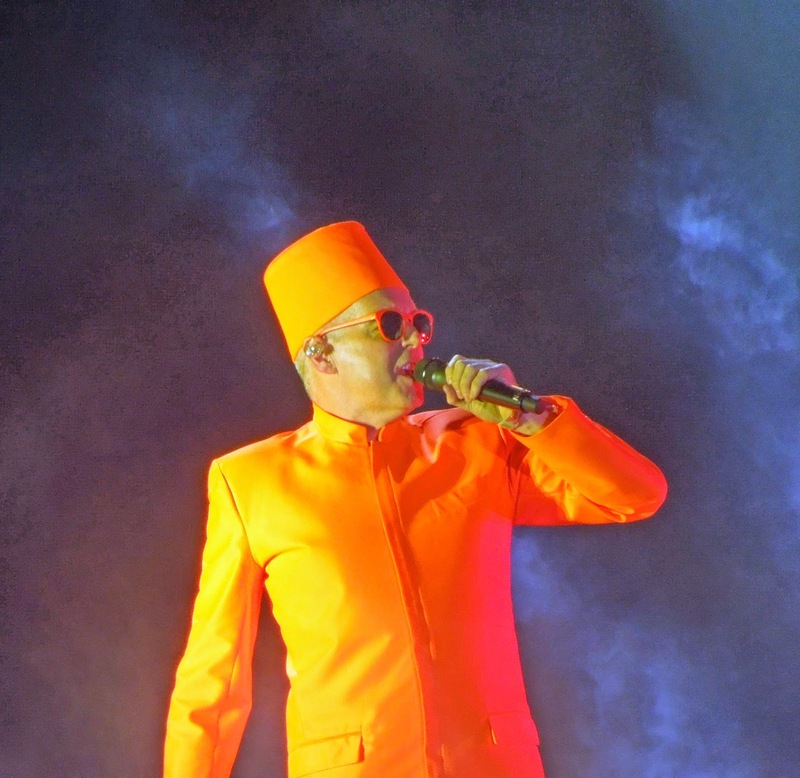 Neil Tennant of the Pet Shop Boys. The fest flew to the finish line on day 3 thanks to outstanding performances spanning the long day. First up was powerful New Orleans-based Trombone Shorty & Orleans Avenue, with the ensemble blending funk, rock, hip hop and jazz for a crowd positioned in front of the Coachella stage. Another early day outstanding turn came via indie singer Courtney Barnett, who featured songs off her first international release The Double EP: A Sea of Split Peas. Highlights of her set included the blues-rocker "David" and the heavy Neil Young & Crazy Horse-tinged "Out of the Woodwork." British pub-minded rocker Frank Turner, hard rocking indie North Carolina rockers Superchunk, genre-busting Beck (loved the cover of Michael Jackson's "Billie Jean") and Canadian troupe Arcade Fire (whose version of "No Cars Go" soared) also impressed in their more high profile sets. This weekend was definitely a three-day party that the Coachella faithful will long remember. Check out the coverage of several other writers from The Orange County Register's team that also covered Weekend 2 of Coachella. You can read George A. Paul's coverage on his Music Minded blog here. You can check out a number of posts featuring reviews from Ben Wener, George A. Paul and me here. Artist Christian Ristow's "Becoming Human"
surveys the Empire Polo Club in Indio. 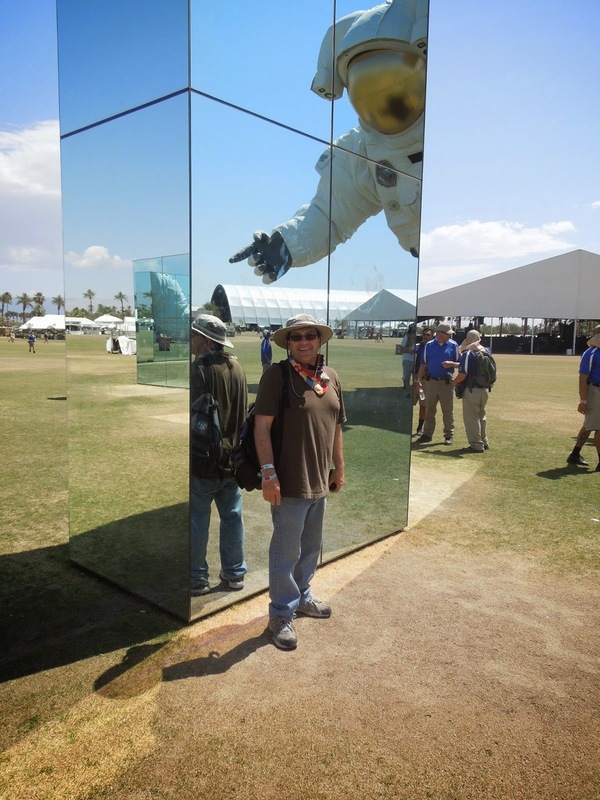 Artist Mike Grandaw's aptly-titled "Caterpillar"
Yours truly in artist Philip K Smith's "Reflection Field." As I get set to hit Coachella Weekend 2 tomorrow, this will likely be my last roundup until next week, but it is a good one! 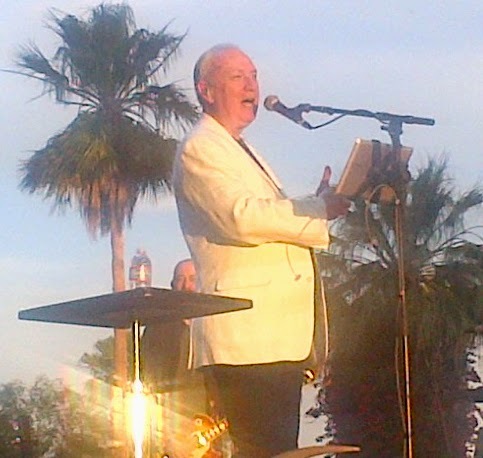 Hope to see many of you in Indio this weekend! Tickets for the Cologne show will go on sale at 9 a.m. CET on Saturday, 19 April from www.eventim.de/coldplay. Ticket information for the remaining five shows will be emailed exclusively to subscribers to the Coldplay mailing list (which can be joined at Coldplay.com). Ghost Stories is Coldplay's sixth album. It will be released worldwide on Monday, 19 May. The Secret Sisters' long-awaited second album, Put Your Needle Down is available now via Republic Records. The Alabama duo's sophomore set was produced by the iconic T Bone Burnett, and marks a giant creative step forward for siblings Laura and Lydia Rogers. Put Your Needle Down is currently available at iTunes, Amazon and other select retailers. 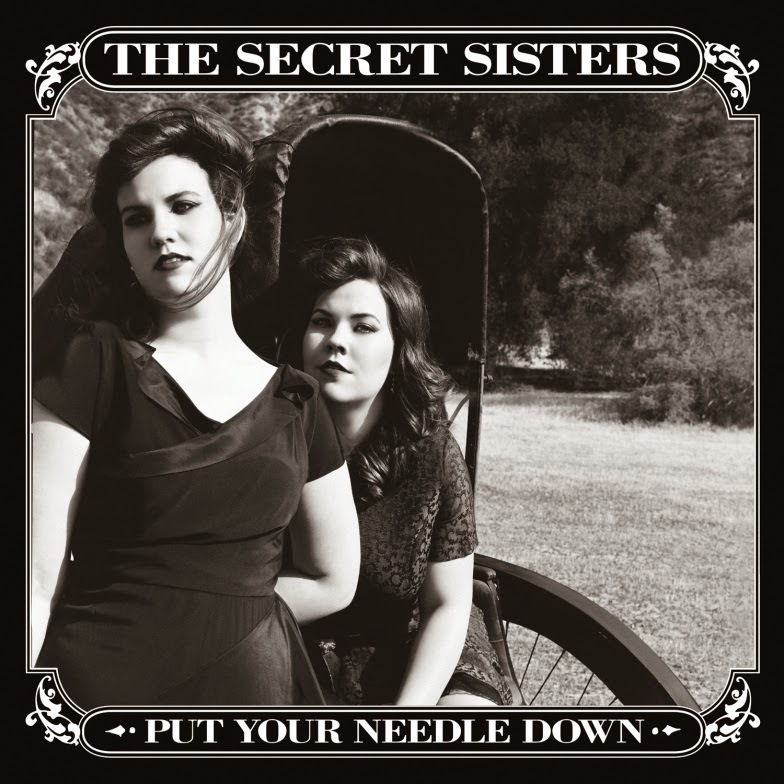 Recently featured on NPR WEEKEND EDITION, they say"The Secret Sisters' music is a nostalgic blend of country, folk, blues and rockabilly," and USA TODAY, which gave the album 4 out of 4 stars, says of Put Your Needle Down, "While still steeped in exquisite sibling harmonies, this albumcontemporizes them." ROLLING STONE says of the album, "Ethereal harmonies once again take center stage on the Secret Sisters' sophomore album [that] takes the listener back to a time when vocalists valued purity over production. But this time around, they manage to marry their signature throwback sound with a lot more energy." The album's 12 songs - primarily written or co-written by Laura and Lydia - seamlessly blend an exciting and decidedly Southern patchwork of country, blues, Americana, folk, rock and gospel. The album is preceded by the new single "Rattle My Bones," hopping from a guitar gallop into sweet, soaring harmonies from Laura and Lydia, it taps into a delightfully entrancing energy that's both enigmatic and endearing. The new album also features the he-said-she-said accusations of "Dirty Lie,"co-written with Bob Dylan. An unfinished song they brought to life, Dylan started writing "Dirty Lie" back in the '80s and when he heard that The Secret Sisters were recording a new album, he sent several demos to them for their consideration and gave the Sisters the nod to finish the song and record it. Put Your Needle Down illuminates the many facets of this diverse, dynamic, and darling twosome and sways from the soulful mourning of "Let There Be Lonely" to the coy "murder ballad" "Iuka", and the uplifting musical baptism of "River Jordan". In support of the album's release, The Secret Sisters are currently supporting country trio Nickel Creek on its entire US reunion tour in April and May. For the first time ever, the second weekend of the Coachella Valley Music and Arts Festival will be broadcast live, as AXS TV–the premier destination for live music events—gives viewers a front row seat to one of the most popular music festivals in the United States. AXS TV will offer incomparable access while broadcasting over 20 hours of live coverage, from Friday, April 18 through Sunday, April 20, airing each evening at 9pE/6pP.